We all love chips in a bag, but have you ever tried making them from scratch? 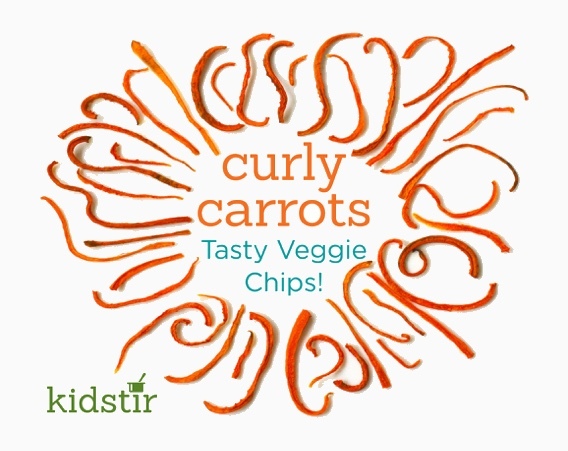 This recipe turns fresh carrots into yummy, crunchy chips you won’t be able to resist. They’re simple to make—and a great way for kids to practice using a peeler. 1. Heat the oven to 350°. 2. Peel the skin off the carrots with a veggie peeler and toss or compost. Then shave the carrots lengthwise into long strips. 3. A grown-up can also cut more carrots into tiny sticks with a knife or mandolin. 4. Place the carrots on the baking sheets and drizzle with the olive oil and salt. Toss everything together with your (clean!) hands. Arrange the carrots in a single layer on the baking sheets. 5. Bake for 5 minutes, then turn the carrots and rotate the pan. Bake until the edges are just starting to brown, about 5 to 6 more minutes. Larger pieces of carrots may need to stay in the oven. You can just turn off the oven and leave the door open while they cook a little more. But keep a close eye on them! 6. Let the chips cool and crisp up. Then serve plain or with the homemade ranch dip from the Kidstir Snack Happy! kit.